The water level is still rising, we have reached 72.4% capacity. Trout are being caught daily along banks and the back wall opposite the marina. Try floating a worm, trolling with rapalas/spoons or some PowerBait. The average size has been 1-3 pounds, 5+ lbers. are also being caught. 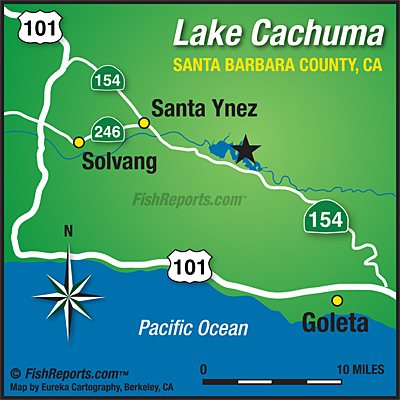 You can also try coves for Rainbow Trout (Johnson, Cachuma Bay, etc.) Large and Smallmouth Bass are being caught, although it is still early in the season. Try along points where reeds are popping up and along the bottom where beds are found. If you are on-shore, nightcrawlers work very well for bass, or try crank baits, plastics, or spoons. Carp have been seen in the marina and out to eat. Crappie are back and being caught with crappie jigs, atomic tubes, and trolling with small lures, they’ve been considerably large on average. There Were 8,000 lbs of Trout Stocked this Year.